Usagi Tsukino, an ordinary school girl is given a special brooch that turns her into the Champion of Justice, Sailor Moon. She's joined by her four friends who are also sailor senshi (warriors): Rei Hino as Sailor Mars, Minako Aino as Sailor Venus, Ami Mizuno as Sailor Mercury and Makoto Kino as Sailor Jupiter. 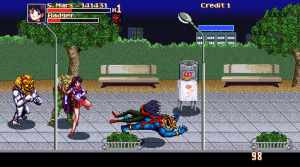 In this first chapter of the game series, the sailor senshi are fighting against Queen Beryl and the Dark Kingdom. Equipped with their trademark moves from the show, this game begins the "Destiny Revival" series.